Portland beats the cold, and New Britain. Mookie Betts kept running, and it wasn’t just because he was so cold. 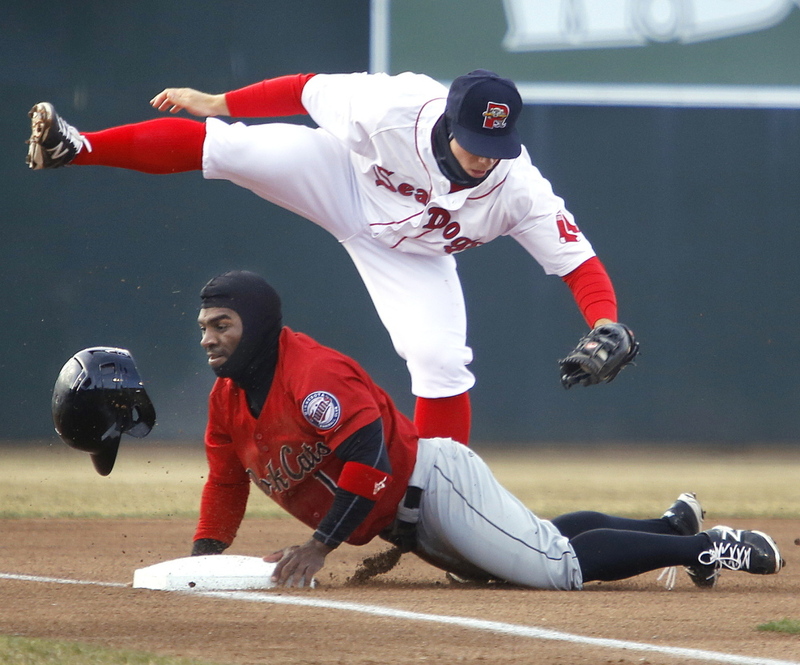 Betts, the dynamic leadoff hitter for the Portland Sea Dogs, motored around the bases while New Britain center fielder Corey Wimberly couldn’t get under Betts’ deep, wind-blown fly ball. Carlos Rivero of the Sea Dogs is met by teammate Peter Hissey after scoring on Matt Spring’s double in the second inning, making it 1-1. Rivero went 3 for 4 with a double. Betts slid into third but when the relay throw got by, Betts raced home. 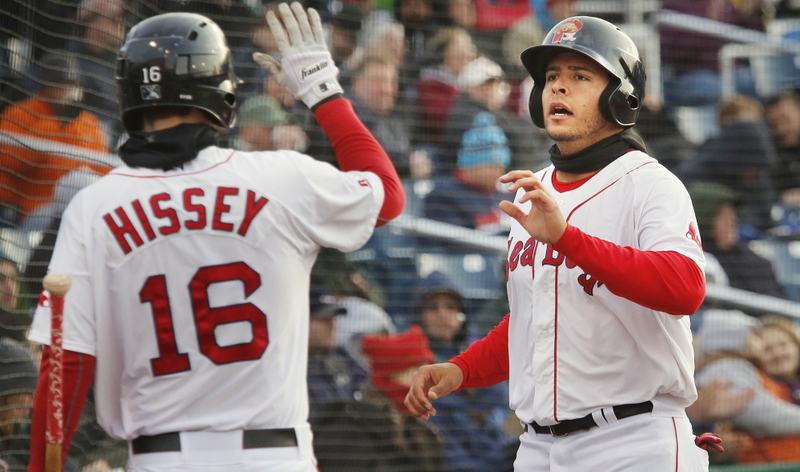 The triple-plus-error added insurance in the seventh inning Thursday night as the Sea Dogs enjoyed a 6-4 home-opening win over the New Britain Rock Cats at Hadlock Field. The game began in 47 degrees with a 20 mph wind. “It was really cold,” said Betts, a Tennessee native. Cold. Windy. No problem for Keith Couch. The Sea Dogs’ starter grew up on Long Island, N.Y.
Couch cruised through 52/3 innings, allowing five hits and one unearned run. He struck out five and walked one. Couch established his fastball, and then came with his slider and change-up. Couch may not attract the publicity showered on No. 1 pitcher Henry Owens, but is 2-0 with a 0.79 ERA. A throwing error by third baseman Sean Coyle led to a 1-0 New Britain lead in the first. But Portland went ahead for good with two in the second and kept building from there. Carlos Rivero, a free agent utility player, went 3 for 4 with a double, two RBI and a run. Coyle singled twice and had an RBI. Matt Spring doubled in a run. And Betts went 2 for 4, boosting his outrageous early average to .464. “I still have a long way to go,” Betts said. Manager Billy McMillon, who had Betts last year in Class A Salem, likes what he sees. Betts’ run in the seventh gave Portland a 6-1 lead. The Rock Cats scratched three runs off reliever Noe Ramirez in the eighth and ninth. He exited with two outs in the ninth and runners on first and third. Jose Valdez relieved and got a groundout for his second save. Back in the clubhouse, players tried to get warm. “The wind was probably the worst thing about it,” said McMillon, who played in Portland in 1995. “I tell the guys that one, the opposition is playing in the same elements. And two, if they want to play in the big leagues – in New York, Cleveland or Chicago – it probably would be just as cold … just deal with it. NOTES: Portland is 4-3 and New Britain 3-4. … The announced paid attendance was 6,022, the largest opening-day figure since 2003. … The new video boards at Hadlock Field didn’t work in the first inning and when operational, didn’t display all the expected information. Plus, no Red Sox highlights were shown. Sea Dogs officials said the problems will be addressed.